Global hedge funds have had a good run in 2013, with the industry attracting net asset flows of US$127.4 billion in the first 11 months of the year. This robust allocation activity, combined with excellent performance-based gains of US$85.6 billion delivered by hedge fund managers puts the current assets under management (AUM) of the industry at US$1.991 trillion. Over the last 13 years the sector has witnessed varying trends – a period of tremendous growth, a downturn and a rebound. In year 2000 total assets in the global hedge fund industry stood at US$335 billion, managed by 2,840 funds. Over the next seven and a half years the industry’s asset base grew almost 500% to cross US$1.95 trillion by mid-2008. During this period the total fund population also increased by nearly 3.5 times. The financial crisis in 2008 reversed this growth trend with assets falling to US$1.29 trillion by April 2009 due to performance-based declines and heavy redemptions by investors. The strong rallies in global markets in the last eight months of 2009, and the subsequent positive asset flows in 2010 aided the industry’s recovery but concerns about the global economy and the European debt crisis stalled this recovery in 2011 and most of 2012. 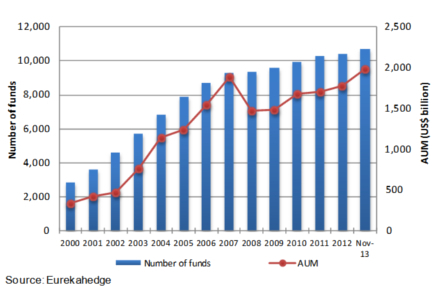 Despite a tumultuous period from 2011 to most of 2012, the hedge fund industry has witnessed an increase in its AUM of roughly 12% since December 2010. In 2012 this recovery was aided by strong performance-based growth even though the industry witnessed net-outflows of US$3.8 billion.